For those who have forgotten, the small Greek letter π Pi is used to represent the irrational number mentioned above that is the ratio, derived from geometry, of a circle's circumference divided by its diameter. For any perfect circle, therefore, the ratio of the circumference divided by the diameter will always equal Pi. What is fascinating about this is that it is a number that goes on infinitely without repeating. (unlike 1/3 which remains .33333....forever, Pi has a nearly random sequence where all the digits are equally represented.) 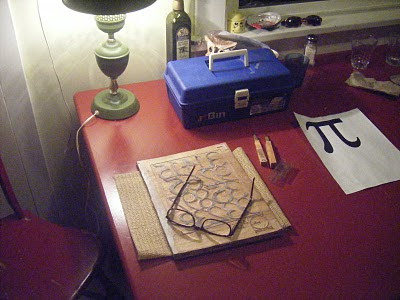 The solving of Pi into the millions of digits had to await the arrival of supercomputers but the problem of pi, of squaring a circle and many other mathematical proofs occupied thinkers and mathematicians from the time of the ancient civilizations until only very recently. Not sure either why this particular diversion of theirs has also piqued my interest. I can't memorize a new phone number anymore so pi beyond 3.14 is all I can manage but I can carve still a bit better than that so we'll count it out to at least 19 digits. Here's the cherry block. The remains of my hanshita (paper guide) are still glued on waiting to be washed off but this will be the first of probably three blocks of my next print. I'm working a bit more loosely, this time in that I think I'll work with just 2-3 blocks and see what I can derive from them. For those attentive readers who recall my "red shed" post, the rains have driven me from my poorly insulated and very damp workshed/studio to the kitchen table. Hope things dry out a bit so I can do some test printing.